As many of you probably know from following me on my various social media accounts and from previous blog posts, lately I’ve been obsessed with fitness. Some friends have joked that I’ve hit a phase that will go away soon, but I like to think of this to be more of a lifestyle change which I’d like to continue for the rest of my life, instead of just after I hit my goal. Because who doesn’t love feeling great, right? During my holiday to Spain, I felt very sluggish, lacking energy when I was walking around and didn’t feel confident in my bikinis – I was unhappy and self-conscious so I half-heartedly decided to start working out when I got back to England. When I got back from my holiday, I didn’t start working out, surprise! I was further unmotivated to after several personal events causing me to, instead, emotionally binge-eat, binge-drink all the unhealthy, fatty good bad stuff which of course, resulted in feeling more sluggish and lacking more energy. I decided mid-August change how I was feeling about myself and a friend had told me that I might be able to out-run the negative emotions I was facing. That’s where it started. Running around the neighbourhood, every day with my parents (perfect bonding time, I must say!) turned into running then going to the gym every weekend which now turned to a more structured workout routine and a happier, fitter, healthier version of myself! 5/6AM – Morning workout, right now I’m working with the FBabs program by Fitness Blender.5:30PM/6PM – Evening workout, usually HIIT/some sort of cardio mixed in with weighed toning (switch it up between upper body and lower body) with Fitness Blender. It may seem like a lot but for me, it doesn’t only keep me physically fit but also, lifts my mood from any negative emotions that creep up so it’s personally worth the effort. If you haven’t heard of FitnessBlender before, I recommend you check them out. They’re a couple who post free (and VERY effective) home workouts on YouTube. You might have come across millions of fitness channels on YouTube and so have I, but these two come across so genuine and themselves that I can’t recommend them enough – workouts have been fun with these two virtual personal trainers. Truthfully, I prefer home workouts to going to the gym mainly because I don’t get self-conscious when certain people stare look and personally, feel like I get more out (e.g. a whole range of exercises) of my home workouts with Fitness Blender. With that said, though I still like to mix it up a bit by going to the gym. Eating clean doesn’t mean “going on a strict diet where you can’t eat anything”, it means changing your lifestyle to eating a healthy amount of clean food so none of the processed junk! Starving yourself or eating less than 1000 calories a day, ISN’T GOING TO HELP YOU. I admit that this is one that I did myself, it’s energy draining and makes you go backwards rather than forwards. Don’t get me wrong – I still eat some chocolate and fries during my “cheat days” but my body has started craving healthier alternatives. ? Nutrition is 80% of what determines if you’ll be successful in recomposing your body. Fitness is 20%. You can’t out train a bad diet. Progress pictures because the scale doesn’t tell you everything! Workout clothes – I’m starting to live in them, how can they be so cute, comfortable and motivational at the same time? Magic, I tell you. Workout playlist, Fitness Blender, and of course, my main source of inspo – Instagram. The fact that working out has tired me out so much to the point that I go to sleep at 9 pm on the dot! For a low-key grandma like myself, this will always be a motivating factor. I fell off the fitness journey because of my crazy schedule and I regret it so much now because I was doing so well! Granted, I was actually burning out with my workout schedule and it was a complete drag at times. KUDOS to you for doing 2 workouts a day! That takes a lot of willpower. And also, thank you for recommending FitnessBlender, I just might restart a workout routine. I’ve been doing Jillian Michaels’ workouts for years, but it’s time I switch it up. Diet is definitely the key to getting in good shape. I’ve found that if I work out and still pig out too much it doesn’t make a major difference. I definitely go through stages when it comes to working out, sometimes I’m doing it almost every day, and sometimes I go weeks – months without doing it at all. I haven’t gone in almost a month and I have to admit this post made me feel bad – so need to get back on it next week! Congrats and all you’ve achieved and also on staying so motivated! Good luck in your goals. I’ve done that, too but sans the gym and just did walking with Marley, my Yellow Labrador and lost a few pounds and counting. I’ve cooked and cooked more than eating out and cooked healthier. I’m glad that you’re doing better and feeling better, too ^^ It’s just such a rich feeling to be in shape. I can feel it too. I don’t get so tired after working over an hour and just can go on for ages, it seems. I am so happy that you’re going hard at the gym! You and Georgie inspire me to go to the gym when I can ;). Even though there were some personal events that made you feel bad, it helped motivate you to partake a healthier lifestyle. It’s amazing that you’re doing really early morning workouts! I can’t even get out of bed at 5am LOL! Eating healthier definitely helps with getting fit. There’s no good coming in when you’re eating 4lbs of nutella every day and going to the gym.. Maybe a spook of nutella is acceptable XD. I loooove yoga pants. It makes doing squats worth the pain :D.
You’re always tweeting about your early morning workouts and I never realized just how early it was (given our time difference) until I saw your workout plan here. Damn girl! I’m usually just falling asleep by 5 AM LOL. That’s so great of you to start a new workout plan that you can stick to. I’ve tried sooo many times but I’ve never got around to actually doing so. I usually get too scared. I don’t know, something about going to the gym alone freaks me out. Like what if something happens to me?? More importantly, i don’t even know what to do half the time, so who’s gonna be there to show me?? I definitely agree with all that you say about how important diet and nutrition is. Ugh, you’re totally inspiring me to (maybe) start trying this whole “fit” thing out again. Hopefully I can get through it! It’s fabulous that this has been helping you so much. 😀 I wish you the best. Thanks for sharing your routine with us! It would be too much to work out twice a day, but if you can make it work and it works for you, go for it! I will have to check out Fitness Blender. I was going to the gym over the summer pretty regularly, but I felt like I could get just as good of a workout at home and I would have to pay the monthly membership. I’ve tried a couple of YouTube videos, but it’s hard to find ones that I really like. So I will bookmark them! I couldn’t agree more with eating healthy as a lifestyle change. I don’t follow a strict diet by any means, but I always try to make healthy decisions. I definitely still indulge in some mashed potatoes and gravy and French fries, lol, but I at least keep it in moderation. I always make sure my lunches and breakfasts are really healthy and then I can have a little more wiggle room with dinner. Workout clothes are the best! I invested in some new pieces over the summer and they definitely motivate me to work out so I can wear them! They are so cute and comfy, I wear my workout pants a lot of the time at home when I’m just lounging around. You look great! If it’s something you enjoy, you are very motivated to do it and it’s easier to keep on track. Aw congratulations!! You are looking super strong! It’s not easy to get into an exercise habit, and I like your attitude that this is going to be a lifestyle change and not just a phase. That’s definitely key. And it is hard to maintain it as life gets busier. I might have ran a marathon this year, but I definitely have not been exercising regularly over the past few months. You’re definitely motivating me to get back to exercising regularly and eating clean again. Wow, you’re awesome for sticking to a fitness routine and eating clean! You look amazing! It’s something I’ve always wanted to do, but I have such a hard time sticking to it. Fortunately, I’ve been working out or running regularly, but I don’t always eat as well as I should, haha. I’ll have to check out FitnessBlender! I definitely like working out at home instead of going to a gym. Agree on changing your lifestyle and not needing it to be a strict diet! I thought dieting would be terrible, but after tracking my food, I realized it doesn’t have to be. Just have to stay away from junk food and control portion sizes! You’re doing great though! It makes me want to get back into healthier habits! I’m so proud of you for sticking with it and trying to reach your goals! Keep at it! I just bought some new gym clothes. ? I also read this post a while ago but didn’t have time to comment but I wanted to! 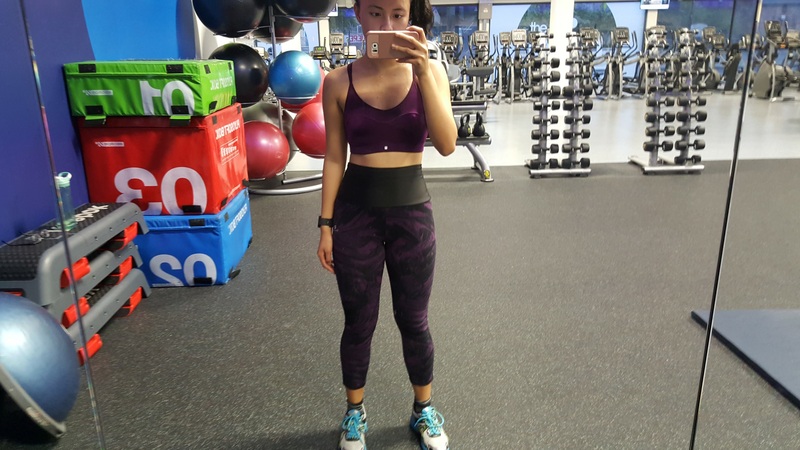 I really enjoy reading about your fitness progress and I actually have a post drafted up about my fitness journey over the years, because getting to where I am now has been hard. I think it’s great that you are starting to fit back into your clothes again like I read in your previous monthly recap post. That’s always a good sign. For me, my clothes are getting smaller though. Oops. ? Clean eating can do wonders! I will admit to not having a stable diet in the past but every now and then I will eat really well for a week or two and it makes a difference! Staying away from too much processed food and making sure I eat more vegetables really makes me feel physically well. But it’s good to have everything in moderation, and it’s OK to have a snack or a treat every now and then. Oh I so need to start working out! I’m getting motivated by your post and so want to hit the gym again! I stopped going about a year back and I bloated out again. On top of that my diet is a dud. I eat anything and everything and my stomach is cursing me for that.